Military schools today are thought of as places to send troubled kids -- but please read this to learn why and when that may or may not be the case. – troubled teen schools and home for troubled youth. There are a number of common misconceptions about what military schools are all about, how they operate, and what kind of students they take. The truth is that America’s military schools carry on a proud tradition of academic and personal excellence which has withstood the assaults of negative media attention and changing fashions in education. These schools offer an excellent education, regardless of whether or not the student is going into the military. Most military schools are most definitely not meant to work with troubled teens. They have little tolerance for boys who are unwilling to follow the rules. However, if a boy has plenty of incentive and drive to change his ways, a military school can be a great place for him to do so. Most kids who have gotten off track need discipline and stability in their life. Military schools provide a military-style structure to everyday life combined with comprehensive academic, athletic and extracurricular programs. A very high percentage of graduates of the military schools in the U.S. go on to attend colleges and universities at home and abroad. Academic training and good results are primary objectives of military schools and always have been. Most military schools think of themselves as “college preparatory schools”, but they have a long way to make that thought the primary thought of parents who are looking for the best training for their child. Boys, and more recently girls, will receive a comprehensive education in academics, sports, extracurricular activities as well as a solid military training. A military education focuses on academics but it also involves teaching cadets to get along with each other, to respect views which differ from theirs and to be an effective part of a team. Because classes are small with typically 12-16 students, your child will receive the personalized attention she deserves. The athletics and extracurricular activities combine with the military training to develop your child’s abilities and personality to the fullest extent possible. Some people tend to think that military schools are all about classes, bunkhouses, marching on fields, and arduous boot camp training. That is simply not the case with today’s military schools. Most offer a wide variety of competitive and leisure sports, clubs, and activities that often far exceeds what private boarding schools and even high schools have to offer. Fact is, most military schools are more like college campuses. The truth is that military schools are simply private schools with a particular emphasis.Most parents expect their son or daughter to graduate from a private school and go on to college. 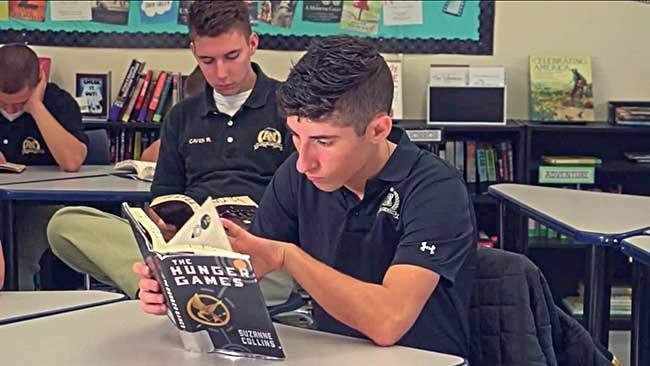 Military schools tend to do this more effectively than any other kind of private or public school, with over 95% of the students going on to college. Fact is, less than 10% of military school graduates head into the military. Military schools simply combine traditional academics with military and physical training and decorum and that tends to lead to a more effective individual, prepared for college, career, and life. Military schools demand respect among the students, but they cherish self-confidence and leadership. One can only be a leader if they think and act of their own accord. Military school students are being trained to follow orders, like the military boot camps. They teach boys to think and act in a responsible and effective way. Discipline takes hard work, persistence, stamina and time. Children need to learn how to work hard, be persistent, develop stamina and patience. A military school education can help provide the structure to accomplish those aims. Military school attendance will not get your child into one of the major service academies. Going to a military school and doing extraordinarily well in every aspect of your life and work there will help. But the key to getting into one of the service academies is getting nominated by your congressman in addition to meeting the academy’s very stringent admission requirements. A low percentage of those who apply are ever accepted. Many military schools offer JROTC or Junior Regular Officer Training Corps. This is a Federal program sponsored by the United States Army. The Army cannot recruit high school students, so it uses the JROTC program to expose young people to the possibilities and potential of military service with the hope that some of them might choose to become part of the armed forces in later life. Needless to say, military schools are committed to the success of their graduates. If a military career is part of your child’s plan, a military school makes perfect sense and most military high schools will help establish a clear path to that end for your son or daughter and may pull some strings for you. Should you need help finding best boarding schools, affordable schools, and Christian boarding schools for boys please let us know. Military schools offer structure, mentorship and a safe environment that limits distractions and temptations that can detract from academic and personal progress. Still, military schools are not always the right choice for every young person. While military schools offer structure, and academic and athletic discipline in a controlled environment, military schools are not intended to act as a rehabilitation program. Military schools want students who wish to prepare themselves for a future in a collegiate, military, or professional setting. Military schools today are thought of as places to send troubled kids -- but please read this to learn why and when that may or may not be the case.